You are here: Home / Wild Blog / Garden Wildlife / Digging, for the birds! The robin is a real opportunist, and often the first to capitalise on the fruits of the gardener’s labour. 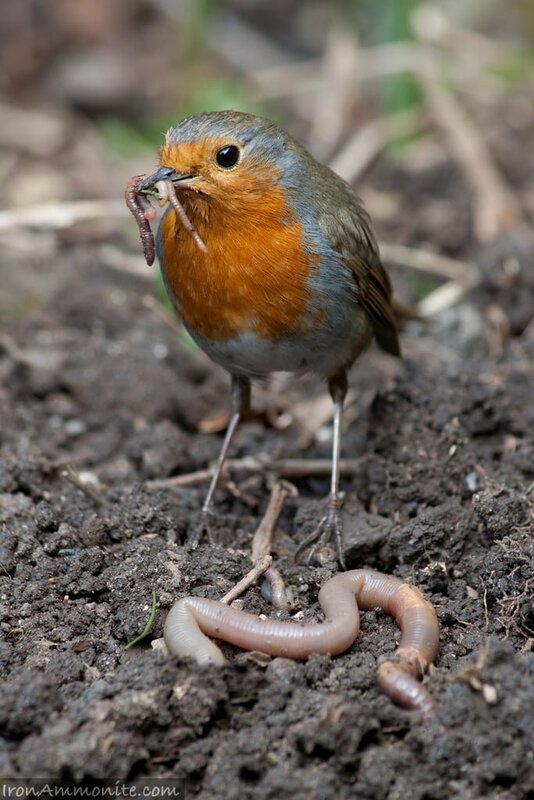 Regular IW contributor Albert Nolan reflects on how a bit of winter digging benefits the bird life in his garden. It was a day when you would have fought to have a shovel in your hand as the icy wind slipped easily through layers of clothes. I was finishing off a new bed that I had started a few weeks ago and for once the frosty weather had been a great help in breaking up the clods of earth and the sods of grass. I was creating a new woodland edge and this consists of tall trees at the back, medium-sized trees in the middle and small shrubs at the front. This layered effect creates a great habitat for birds, butterflies and moths. Also when the trees mature and cast shade weeding will be kept to a bare minimum. After I had removed all the weeds and large stones I dug in plenty of well-rotted horse manure. The soil is the foundation of our gardens and any time spent preparing and enriching it will yield dividends over the coming years. This had loads of earthworms in it and after as few minuets the resident robin in my garden appeared. I threw him a small worm but he did not approve and eventually settled on a plump worm that was nearly the same length as him. It wriggled in his mouth and for a few seconds he was transformed into an avian Medusa with his head of snakes. Writing at the start of the Second World War Vita Sackville West penned these immortal lines in her epic poem “The Garden”. During my extended lunch break I was admiring my handiwork from the comfort of a warm kitchen. The Robin was still feeding but was joined by a male blackbird. These were once woodland birds and love to forage in leaf litter and soil for food. He did a great job of scattering my mulch as he looked for grubs. The cold weather has frozen the soil and this makes it very hard for ground feeding birds to find food. Just as the countryside was transformed from arable to pasture our gardens underwent a similar evolution and productive vegetable patches were hidden under grass and paving slabs. Thankfully the dying art of using a fork is being revived as people realize the benefits of growing your own, and this has many benefits for birds like the blackbird. Next to arrive was a hungry flock of Chaffinches. At this time of year the supply of seeds is nearly exhausted but the soil in our gardens can contain hundreds of potential weeds. The chaffinches are like nature’s Hoovers, and they spent the next few days methodical cleaning the bed. This will make my job of maintaining the bed over the coming year much easier. Rooks put in a brief appearance and probed in the soft soil looking for leatherjackets, the troublesome larva of the cranefly, otherwise known as the daddy-long-legs. The last bird to arrive was a pied wagtail. When you dig the ground any resting or hibernating insects are disturbed and this provides a brief feast for the wagtails. Even before my trees have set root and produced their first berries, or offered a convenient perching branch for birds, nature, it seems, is already reaping the rewards of this new habitat I’m creating. “But the good gardener with eyes to the ground lifted towards the sunset as he scraps his tools at day’s end, looks into the west, examining the calm or angry sky to reckon next’s day chance of fair or ill, of labour or idleness enforced,” wrote Sackville West. Words written so strange and deep will eventual fade but hopefully my woodland edge will echo with bird song for years to come. For now the calls of the children looking for their dinner will have to do. Beautifully written, beautifully felt. Thank you.